Those of us who have not spent time in the armed forces may have only a vague sense of how the world’s foremost military power operates in field conditions. We must rely on second-hand sources like books, presentations and anecdotes, which are hardly equal to the task. Fortunately, there is the “boss lift,” an increasingly available and popular arrangement letting community leaders observe firsthand what is involved in active military training exercises. On Aug. 14, I had the good fortune to be invited, along with some 25 other Seacoast area business leaders, to travel to Camp Grayling, Mich., to observe combined U.S. Air Force Reserve, U.S. Army, National Guard, Marine Corp Reserve and international partners conducting a joint multinational combined arms exercise in a wilderness area covering some 400,000 acres. Our day began with briefings by Bruce Thompson of our host organization, Employer Support of the Guard and Reserve and officers of the 157th BH Air National Guard, including Commander John W. “Pogo” Pogorek. 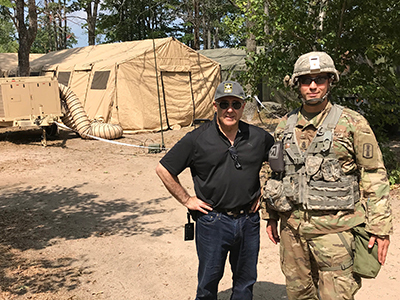 Also on hand was Brigadier General David Mikolaides, the adjutant general of the NH National Guard who would be travelling with us to inspect the same operations we would see. We then boarded our transport, a venerable Boeing KC-135R Stratotanker, the Air Force’s workhorse for more than 50 years. Though our plane was a vintage 1956 model, it was retrofitted some 20 years ago with high bypass turbofan CFM56 engines by General Electric and Snecma, as well as advanced avionics systems, making it capable of cruising at more than 550 mph with a range of 5,000 miles and of carrying 83,000 pounds of fuel — enough to refuel multiple fighter jets mid-air through the use of a flying boom, and of returning to base with plenty of fuel remaining. The KC-135R will be replaced by the next generation KC-46 Pegasus Supertanker, of which the 157th NHang is expected to take delivery next fall. We touched down in Alpena, Mich., around 1000 hours and received more briefings. We then boarded buses for the drive out to field operations, 93 miles away. Arriving at 1330 hours, I was greeted by Sergeant Major Matt Canavan of the 197th Field Artillery Brigade, the non-commissioned officer (NCO) in charge of operations for this exercise. Matt also happens to be a full-time employee of my company working on education and outreach for federal benefits programs like the new Federal Dental & Vision Insurance Program being rolled out to military retirees this fall. Matt introduced me to several of the NCOs under his direction and took me on a tour of some key pieces of equipment in use that day, including a HIMARS Rocket Launcher, an M1151A1 Variant HMMWV (“Humvee”) and an M-1048 resupply vehicle. We then watched a live-fire exhibition of four RRPR (“Ripper”) rockets hitting targets some 12 to 18 kilometers distant. Finally, we took a tour of the command center, made up of several large synthetic tents joined together with numerous technicians hunched over laptops and looking at monitors. We received several briefings by field commanders on how the exercises were unfolding. I noted with interest the division between the units focused on the current state of the battle and those concerned with where the battle was expected to be in 24 to 36 hours. Such division allows maximum focus and team input on a whole range of factors and contingencies. Matt then showed me his tent, which he shares with two officers. His bed was a narrow metal cot with a sleeping bag. Standard fare is MREs. I craved some coffee but saw no Starbucks or any high end-comestibles anywhere. After expressing our thanks and taking a few pictures, we took our leave, boarded our buses and headed back to Alpena. On the flight back, I was pleased to be invited to sit in the rear of the cockpit during takeoff. This is an experience I will not soon forget. I noticed upon lift-off that the co-pilot was carefully tending the steering wheel and the throttle. I inquired of a flight technician why he simply didn’t use auto-pilot. I was told that back in the 1950s, there was no auto-pilot. Pilots were expected to take off and land these big birds manually. To watch them do it is inspiring. We returned to Pease about 2000 hours, in time to enjoy the last light of a fine late summer evening, and then went our separate ways. But the memories of what we experienced will remain. We had a chance to see young men and women who are keen, fit, disciplined and eager to improve their skills. We saw sophisticated hardware and even more sophisticated software leveraged to advantage. We saw a code of honor in action, and were reassured that the younger people who will be leading this country one day are well prepared to defend our Constitution and way of life. There is one more item that all of the bosses took away, namely the importance of employers connecting with both active duty reservists and those recently retired from the military and looking for good jobs. But the benefits of providing jobs to reservists and retirees are not just to the advantage of those hired; they rebound to the advantage of the employer itself. When an employer hires a reservist, or any military retiree, that organization is getting in many respects the best that our labor force has to offer: people who are carefully screened for character, people who are disciplined, people who are continually trained and mentored to be leaders, people who are dedicated to service, people who are ready to assume the duties and to execute the missions they are given, even when those duties and missions carry risks, as they often do. Hiring people of this caliber is something no smart employer will fail to support. The Pease boss lift 2018 drove this point home deeply. For those still on the fence about what military personnel can add to a company or organization, I recommend that you get yourself lifted soon and see what you’re missing. It’s a lot. Paul E. Forte is CEO of Long Term Care Partners in Portsmouth.